En Primeur 2009: We are pleased to announce that all 2009 en primeur wines purchased will be entitled to 4 years free storage in Bordeaux effective from the date of purchase. For more details, click here. 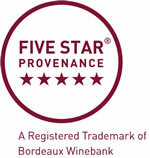 For a full list of our en primeur listing, click here.